Is your home stuffed with trinkets, treasures and things you no longer need? Are your shelves and storage cupboards overflowing with who knows what? Are your clothes squashed into your wardrobes and drawers? If this sounds like your home then it could be time to do a spot of decluttering – many of us may hate the idea but we know it makes sense. Most people are natural hoarders and even the neatest home probably has a cupboard, a loft, a garage or garden shed that is their junk room. But if you have less junk in your home your life really will be better. Less stuff means less to clean and keep tidy; it means it is easy to find things in the early morning rush to get to school or work but getting into the decluttering habit is not easy. Start by making a list of each room that is unnecessarily cluttered and the particular parts of that room that need tackling. It could be shelves stacked high or chests of drawers with junk piled on top because all the drawers are full (hang on, that is beginning to sound like my daughter’s room). Now pick just one room – or just one part of the room if it is particularly bad – this is the clever bit. Work on that area until it is done and then stop. By taking a bite sized chunk of this problem each day or week you can achieve great things after a few days or weeks and not feel as if decluttering has taken over your life. Grab a large black bin bag and set yourself a time challenge to see how quickly you can fill it. Decide before you start whether the content will really go in the bin or whether they are good enough to go to a local charity shop or other good cause. If you do decide to fill a charity bag just make sure you take it to the charity shop the same day – otherwise it will just be clutter in a bag. Start by making sure you have a bunch of hangers that are 2 different colours. Put all of one colour in the bottom of the wardrobe and hang all your clothes on hangers the same colour. Each time you wear something then wash and iron it place it back in the wardrobe on a hanger from the wardrobe floor. After a few months you will start to get a pretty good idea of the clothes you never wear as they will be on the original colour hangers. Obviouly there may be some special occasion outfits that you will want to keep even if you haven’t worn them for 6 months but on the whole this is a foolproof way of reminding yourself what you really don’t wear when it comes to everyday clothes. You know really you just need that reminder to get them out of the wardrobe and down to the charity shop or clothes recycling bank. Think of the extra space it will give you – more space for the clothes you do like and do wear and maybe even some more space for new clothes. We can all find 5 extra minutes in the day if we really try – in fact, you probably won’t have to try that hard to find a spare 5 minutes. Open up a single drawer or cupboard and just get started – don’t think too hard about it. I probably shouldn’t say this but for my 5 minute declutters I just dump everything I don’t want straight in the bin – there is simply no time to sort thing sout on one of these ultra fast decluttering sessions and I console myself that when I have more time I do recycle almost everything either via the local recycling centre or via various charity shops. 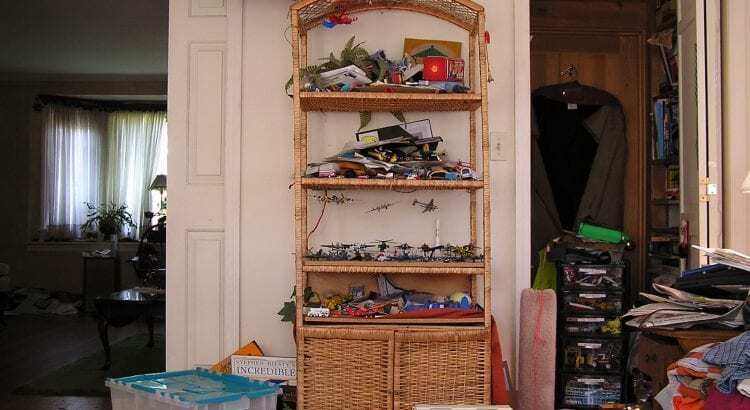 Tackling small spaces in five minute blasts means decluttering won’t feel like it is taking over your life and you’ll maintain your motivation for longer. If you really want to think about setting a timer on your watch or phone – there’s nothing like the seconds and minutes ticking away to spur you on to actually achieve something. This is one of my personal favourites when it comes to decluttering and great if you have kids – it is just as good and just as much fun for all ages from toddlers to teens. Making decluttering into a game that everyone can play is a great habit to get into. So what is the 10-10-10 challenge? It’s simple everyone in the house has to find amongst their own possessions 10 things to throw away, 10 things to give to charity and 10 things to put back in their correct place. Just make sure you do actually bin the rubbish straight away before anyone changes their mind. Decluttering a whole house in a single day or week-end is almost impossible – it is demoralising and often difficult to know where to start. So instead try one of these clever and fun ideas over a few days, weeks or months and then keep them up to prevent the clutter from returning. Tackling only small areas is much more manageable and will help maintain your motivation and see the task through until you eventually have a clutter-free home.